Jatizso is a city in the southeast corner of the Fremennik Isles. The Isles are located northwest of the Fremennik Province and west of Miscellania. 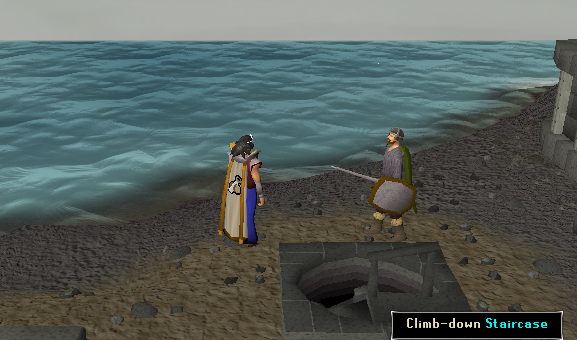 To get here, you are required to have started the quest, The Fremennik Isles, and use boat travel. In the city of Rellekka, head to the northern most dock and speak with Mord Gunnars. Speaking with him will start the quest and grant yourself access to Jatizso. In this city, you can find fishing spots, a mining dungeon, a bank, and more. This is where you will land once you arrive at the city. You can also leave from here. Speak with Mord to be taken back to Rellekka. 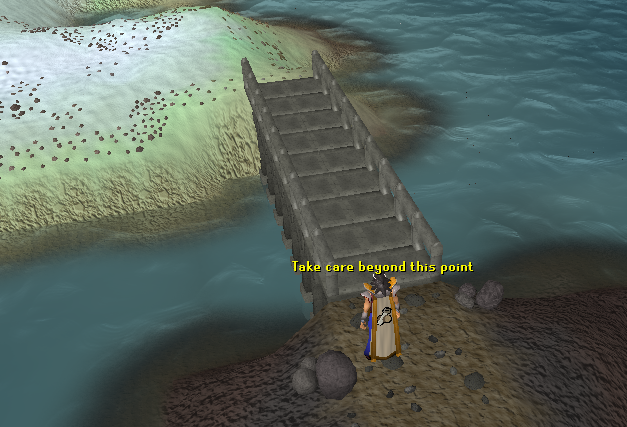 Around the outside area of the city and near the landing dock, you can find multiple fishing spots. 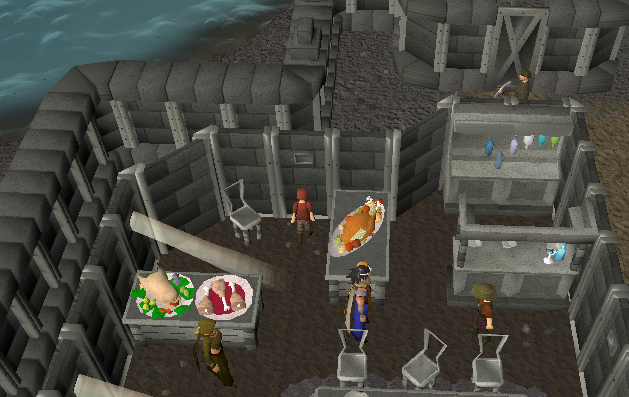 This is similar to the Fishing Guild. 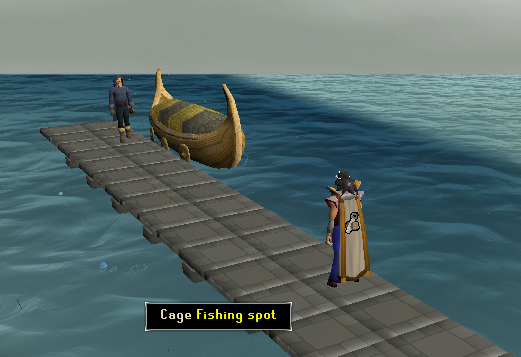 The options to fish include "Cage and Harpoon" and "Net and Harpoon". This area is not commonly crowded, so fishing in this vicinity is not a bad idea. You might also notice some fishing spots (that you cannot fish from) are further out in the sea than close to the edge of the land. Now we will explore the inside city. The first attraction is the bank. This bank holds the same purpose as any bank: withdraw and deposit items. 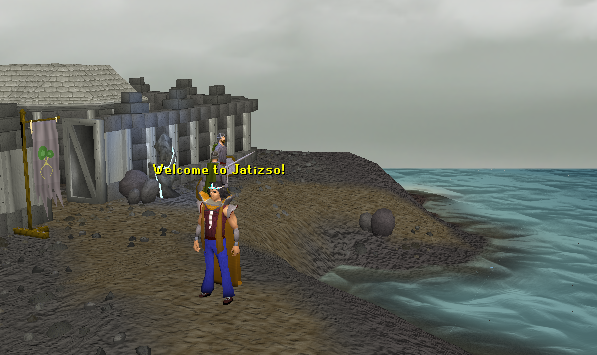 When completing The Fremennik Isles, you are required to collect tax from certain citizens in Jatizso. No matter what tax is being enforced, the banker will not pay a single coin. It would be best to leave the banker alone, as he is a good person. North of the bank is a building with a bread-shaped symbol. However, this building is not your typical general store. It is actually a fish-selling store, owned by two NPCs. One of them sells cooked fish and the other sells raw fish. This store is owned by Flosi Dalksson. This store is owned by Keepa Kettilon. At the north end of the town is the north gate. Beyond the gate is an area inhabited by deadly Ice Trolls. 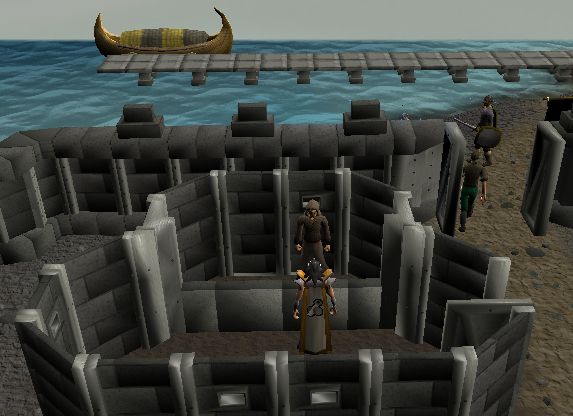 Those who have completed The Fremennik Isles would know. Do not go past this gate unless you are properly armed and carry food. North of the King's house is a restaurant owned by Vanligga Gastfrihet. This may be a restaurant, but she does not serve any food, at least not to you. Not only does Vanligga own a restaurant, she also owns a Yak store. This Yak store is under illegal business: selling goods from Neitiznot on Jatizso. In order to access the store, you need to refund the tax Vanligga paid to the king. Refund her, and she will open the Yak store for you to use. There are two other characters in the restaurant: Grundt and Brendt. Grundt and Brendt are two dwarven engineers from Keldagrim who have overstayed their welcome at Vanligga's restaurant. They have ordered fourteen plus dishes of food. West of the bank is the house of the King, King Gjuki Sorvott IV. Many people in the city dislike the King, due to his constant and high taxes. The King plays a part in The Fremennik Isles and is the one who provides you with the jester costume. The King is not the only one in his house. There is also Thorkel Silkbeard and HRH Hrafn. Thorkel is the King's advisor. He helps and handles problems with the King. HRH Hrafn is the King's loyal cat. Wield an Amulet of Catspeak to have a chat with the King's cat. For our next attraction, head west and go past the west gate. Move north, then east. You will come to a set of stairs and will find Gruva Patrull. Gruva is a guard who guards the set of stairs you see next to him. These stairs are the entrance to the mining caves. The caves contain 16 mithril rocks, 11 adamant rocks, 11 tin rocks, 10 iron rocks, and 6 coal rocks. However, be careful. They are some aggressive Ice Trolls that will hit hard on unsuspecting miners. Once you are finished exploring the mining cave, head southwest and climb the ladder you see. You will be taken to a tower with a Jatizso Guard. 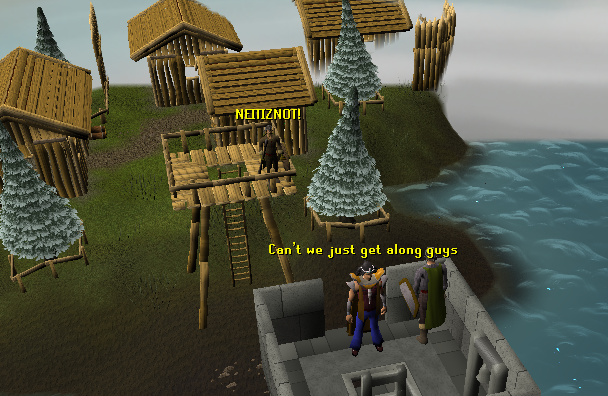 The guard is shouting across the tower at a Neitiznot Guard. Both will continue to shout "Jatizso!" or "Neitiznot!" 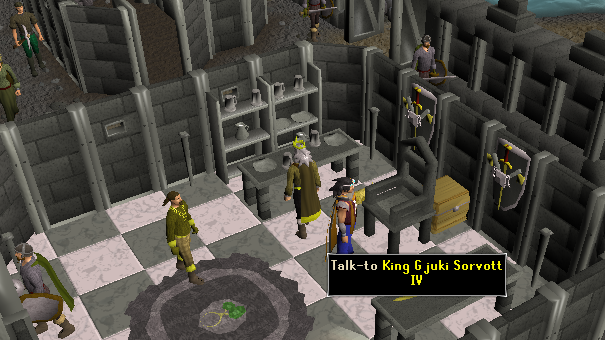 You can watch an interesting cut-scene between the two guards by right-clicking one of the guards and selecting the option, "Watch-shouting Guard". West of the King's House is a shop that sells Mithril weaponry. There is also a single anvil in the center of the shop for all your smithing needs. This store is owned by Skuli Myrka. South of the weapon shop is an armor and ore shop. There are two NPCs in this building. One of them owns the armor shop and the other owns the ore shop. There is also another anvil south of the shop's entrance. This store is owned by Raum Urda-Stein. This store is owned by Hring Hring.